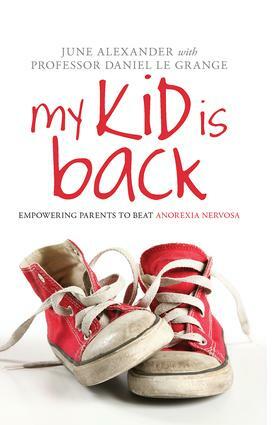 My Kid is Back explains how family-based treatment can greatly reduce the severity of anorexia nervosa in children and adolescents, allowing the sufferer to return to normal eating patterns, and their families to return to normal family life. In this book, ten families share their experiences of living with anorexia. Parents describe their frustrations in seeking help for their child and dealing with their behaviour and sufferers discuss how the illness gets into their mind and takes over their personality. By focusing on the Maudsley family approach and expert advice from Professor Daniel Le Grange, and including clear lists of illness symptoms, strategies for parents and carers to follow, and information on getting further treatment and support, this book proves an essential resource for families who want to win the battle with anorexia nervosa. I, and the families I work with have found My Kid Is Back invaluable. It was particularly helpful recently when I was referred two young boys with the Anorexia Nervosa disorder within a month of each other. Matthew and his family’s story helped the family to deal with it. - Glenn Munt, Thinking Families, Queensland, Australia. Introduction. Le Grange, Family-based Treatment of Adolescent Anorexia Nervosa: The Maudsley Approach. Family Case Studies. Chloe. Matthew. Kelly. Kristen. Hayley. Claire. Kylie. Billie. Annabelle. Alice. What are Parents to Do? Le Grange, How to Tell if Your Child Has Anorexia Nervosa. Navigating the Search for Family-based Treatment. Appendix: Listing of Providers and Support Services. June Alexander is a writer and journalist with a particular focus on eating disorders stemming from her personal battle with anorexia and subsequently bulimia, that was undiagnosed for 21 years. June is a strong supporter of the Maudsley family approach to treating anorexia nervosa, and is based in Victoria, Australia. Daniel Le Grange is Professor of Psychiatry in the Department of Psychiatry, and Director of the Eating Disorders Program at the University of Chicago, Chicago, Illinois. He trained in family-based treatment for adolescent anorexia nervosa at the Maudsley Hospital in London, where he was a member of the team that developed the Maudsley Approach as a treatment for early-onset anorexia nervosa.